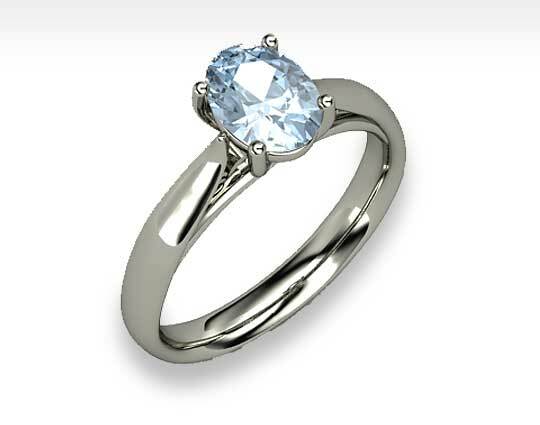 Oval Aquamarine Ring - Thousands Happy Customers! Aquamarine is a type of pale blue to green gemstone which has been used in ornamental jewelry for centuries. It is a type of beryl, a stone which contains a mixture of beryllium, aluminum, and silicate: other beryls include emeralds, golden beryls called heliodors, and morganites, also known as rose beryls. The chemical formula for aquamarine, along with all other beryls, is Be3Al2(SiO3)6. The color of the stone comes from trace amounts of iron which have become embedded in the hexagonal crystalline structure of the stone.